Ladyfish | Barbed Steel Charters, Inc.
Know as the “poor man’s tarpon,” this fish garners more respect in the fly fishing realm. Small in stature, it displays all the similar fighting traits of its much bigger cousin, the tarpon. Ladyfish are quick, agile, and jump repeatedly when hooked. They take a fly readily and are a great practice fish for the novice saltwater fly fisher. They are found in schools and once located, they will provide rod bending action on almost every cast. 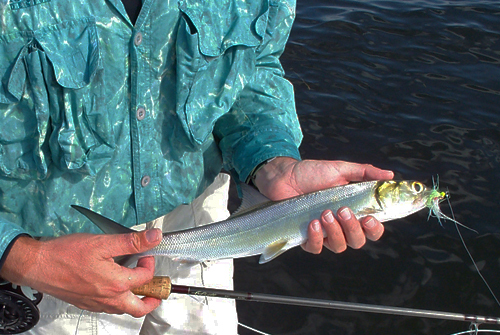 Most ladyfish average 1 to 2lbs with bigger individuals giving you a real tussle on light tackle.